The Quebec aerospace sector represents half of the Canadian aerospace industry. With a workforce of almost 40,000 employees, it is placed sixth worldwide just after the United States, France, the United Kingdom, Germany and Spain. The preeminence of Quebec in this field is due to such world-renowned actors as Pratt & Whitney, Rolls Royce, Bombardier Aeronautics and, since 1981, GE Aviation who all have taken up residence within its borders. It is also important to note that 70% of all research completed in Canada by the aerospace industry, is done here, in Quebec, which allows this sector to remain on the cutting edge of all technological innovations and ensures its growth by continually creating new products1. The presence of GE Aviation and its robotics, automation and instrumentation research and development centre located in the Bromont Science Park illustrates the importance of this sector, notably concerning vanes, engine components and aircraft doors building expertise. 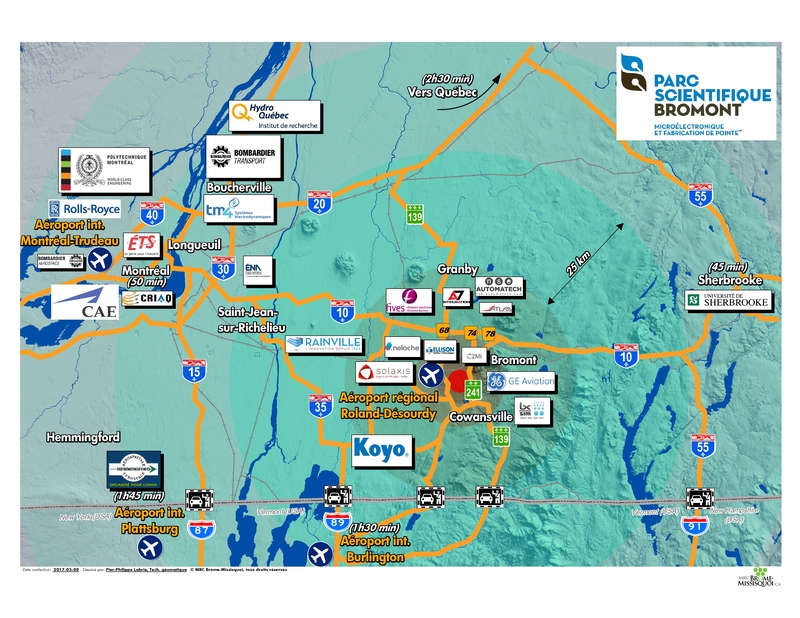 Furthermore, the fact that the regional airport is located inside the Bromont Science Park creates a very promising alliance for the aircraft services sector and many companies have acquired the MACH certification. MACH certifications have the objective of optimizing Quebec aerospace supply chain performances in order to increase its international competitiveness.